Guest Bio: Anne is internationally acclaimed neurologist and a prime leader in stroke prevention research and evidence translation. Anne is a 2014 Bupa Health Foundation Health Award recipient for her project which will now implement this discovery and related findings into practice. Anne is here to talk about her project to prioritise non-invasive strategies over carotid artery (heart) surgery in stroke prevention. Katherine Lodge: Thank you for listening to Health Professional Radio. I’m Katherine and today our guest is Adjunct Associate Professor Anne Abbott from the school of Public Health and Preventive Medicine at Monash University. Anne is an internationally acclaimed neurologist and a prime leader in stroke prevention research and evidence translation. Anne is here to talk to us about her project and how to prioritize non-invasive strategies over heart surgery when it comes to stroke prevention. 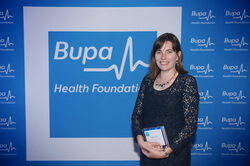 Anne is a recipient of the 2014 Bupa Health Foundation Health Award for her project and she can now implement this discovery and related findings into practice. Welcome to our show Anne. Anne Abbott: : Thank you very much Katherine. K: Now, Anne can you give us an overview of the work that you’ve been doing in relation to stroke prevention? A: Yes. So it started about 15 years ago when I chose to do a PHD, I wanted to do some research. Being a neurologist I realize that there so much to find out about the brain and therefore we need to do research to find that out. In my area, it turned out to be stroke prevention and I was researching with patients who had narrowing of their carotid artery. The carotid artery is the main brain artery. And the origin of that artery in the neck there is a very common site for Atherosclerosis or Arterial Disease that causes lots of problems including heart attack and stroke. A: Yeah. So it’s a build up of plaque affecting the artery in the arterial walls. A: This sort of disease, arterial disease can happen anywhere in the body, that depending on which organ’s affected. If there are complications like that artery block, you get complications on that organ. If it happens in the heart, it’s a heart attack, if it happens in the brain it’s a stroke for instance. And I was examining patients who had the carotid artery disease as we call it, so arterial disease in the carotid artery and most of my patients in my main study, those patients were seemed to be afraid because they haven’t had previous stroke or TIA involving the distribution of that artery. A: And we were trying to work out what is the risk of stroke, without surgery or thinking to try to remove that plaque. And who is at highest risk of stroke, so then perhaps we can better target surgery or … to reduce the risk. So during that study we did embolus detection, transcranial embolus detection, and we were trying to see if that was a way identifying high risk patients because these patients are shedding a little bit of emboli escalation that might mean the plaque is active. A: So the research took quite a while, and to our surprise we found that these patients would just give advice about health lifestyle and encouragement to take the appropriate medication. We found the risk of stroke were two or three times more than expected based on the existing … which was the general scientific information that was available at that time. K: Right, I see. So your main findings were that if you could margin it at an earlier stage, it wouldn’t have to get to the point where they would require heart surgery is that the? A: Well that just triggered some surprise and that was just the average of that 200 patients. The stroke rate was much low than we expected. And then I thought, well all around me people would this legion were encouraged to have surgery to reduce their stroke risk. So they’re encouraged to have the plaque removed and I thought well, that sort of advice was based on randomized trial which were conducted in about 20-30 years ago. So they compared surgery at that time versus medical treatment which is we known basic stuff – a healthy lifestyle and medication. But those trails were done about 3o years ago and surgery had provided a very marginal stroke prevention benefit. But since then, surgery has been sort of the recommended treatment but I wondered at the end of my PhD whether perhaps medical treatment, non-invasive treatment had improved since those trials and perhaps we don’t need to operate routinely anymore. And so I went to do more research and in that research … I looked to all the published rate of stroke in patients with these symptoms we called carotid arterial disease. And I spoke to them to see whether the average yearly stroke rate have fallen on not just with non-invasive measure. And the fact it has, it’s fallen about going about 80% over the last three decades. A: Yeah, so that was a very dramatic fall and now we’re seeing an annual rate in every place with that a half of percent per year. So that means about a half of percent of these patients, there’s 1% will have a stroke caused by that carotid artery disease. If they’re just trying to have a healthy lifestyle and using the appropriate medications for their risk factors. A: That implies that you don’t need to have that carotid artery surgery anymore. At least the vast majority of them don’t because it’s only half of a percent per year who don’t have a stroke, but most of them are diagnosed with this … when they’re about 70. So any of that 2.5% in fact of this people will have a stroke due to their lesion with their remaining expected lifetime. Just a very low… yes. K: So yeah, now you’re findings can potentially save hundreds and thousands of patient from having such dangerous procedures and as you said it, at the moment that you aged as well which very dangerous for them. And also less of a burden on our healthcare industry and the hospitals. Great to hear the statistics on that. And in regards to Bupa Health Foundation Health Awards, what will this funding going towards? A: Well the funding will be going towards, well, continuing to get that current message out but also to build on that message. This discovery was made by not only our own research, on our 5th one study and one study in one point of time involving 200 patients, but it was involved in using that in the context of all available information’s published out there. And at the moment historically in fact, there’s been just a lack of support and activity involved in making sense of the information that’s already out there, that’s already public. So everyone tends considered their own little thing and published it and there’s not enough integration work going on. A: So what I’ll be doing is a number of systematic reviews of the information that’s already out there in relation to difference questions around carotid arterial disease. So we’re making sense of the information out there, so I can answer the questions and I’ll be publishing that with my collaborators. So that the doctors get the message and we’ll share our knowledge with the doctors around the world but also we’ll be showing that knowledge with policy advisors and the health service funders and also the public. We’re going to share it by the public by translating into their … into a very simple, lay person summary so that everyone will have access to the information and we’re going to do this by our website which will publicize there when it’s ready. And we’ll be publishing it to our own patients and other doctors around the world. So hopefully it would be well utilized. K: Yeah. Well thanks again today for your time Anne and congratulations again on the award. A: Thank you very much and thank you for having me.